The first win of the season has never felt so fulfilling. Carey had the game-winning kill in the decisive fifth set, as the Bobcats outlasted the La Salle Explorers, 16-25, 25-22, 21-25, 25-19, 20-18, Friday night in front of 378 fans in Burt Kahn Court, the most for a home volleyball game since 2006. The Bobcats faced match point three different times, but fought back after each one. Payne tied the set at 14, while Allen tied it at 15. Samantha Tulskie, who finished with 13 kills for La Salle, hit a ball into the net to tie it at 18. Three of Carey’s team-high 13 kills came in the last set, which featured 11 ties and six lead changes. Kayla Lawler finished with a season-high 41 assists, freshman Tierra Allen registered 13 kills, Olivia Grattan had nine kills and three different Bobcats were in double-figures for digs. Riker, the team’s leader in digs per set last season, went down in the third set to injury. Carey, Tracy Wright and Krista Bennett more than filled in. Carey earned a double-double with 12 digs, while Wright finished with a team-high 18 and the freshman Bennett added 13 of her own. “When Logan went out, we really felt like we had to step it up because she’s a big presence on our team,” Carey said. Riker finished with eight digs while Lawler added nine too. 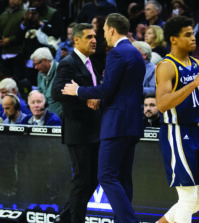 Quinnipiac (1-6) lost its first six games in the Loyola Marymount Invitational and the University of Maryland Invitational, including a loss to 11th-ranked UCLA, but returned home to secure win number one. 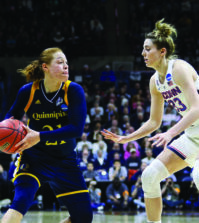 Led by Allen’s two solo blocks and three assisted blocks by Payne, Grattan and Samantha Jablonski, the Bobcats recorded nine blocks in the game, while the Explorers (2-8) only notched two. The Bobcats trailed, 2-1, after three sets before Allen took over. Playing in front of her parents, including NBA player Ray Allen, seven of her 13 kills came in the final two sets. Five different La Salle players finished with double-digits in digs, including 22 by Breanna Mazalewski. Kelly Scanlon had a team-high 14 kills and Kourtney Clark recorded 38 assists. The Bobcats play Saturday morning at 11 a.m. against Navy and again in the afternoon against Delaware State.